Evette Cardona is a native Chicagoan and a graduate of the University of Chicago's School of Social Service Administration, where she received the 2008 Elizabeth Butler award for outstanding professional success and achievement in social work, the U of C's Leadership in Diversity Alumni award in 2010 and where she teaches a course in philanthropy and public policy. She is a Senior Program Officer at the Polk Bros. Foundation and the secretary of the board of directors of the Donors Forum of Illinois. Evette is active in Chicago's LGBTQ community and was inducted into the Chicago LGBTQ Hall of Fame in 2002. 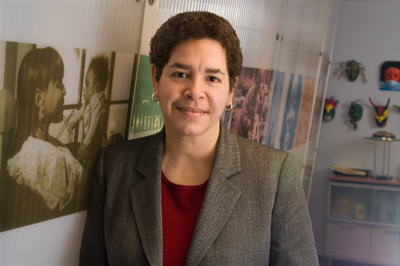 She is the co-founder of Amigas Latinas, a member of Chicago Foundation for Women's Lesbian Leadership Council and an advisory board member of the Institute for the Study of Women & Gender in the Arts & Media at Columbia College. She has been honored with numerous awards for her community work including the ACLU/Chicago's John R. Hammel Award, Mujeres Latinas en Accion's Maria "Maruca" Martinez award, the Illinois Women's Bar Association's Women with Vision award, and leadership awards from the Illinois Association of Hispanic State Employees, the Near Northwest Neighborhood Network, the Coalition of African, Arab, Asian, European, Latino Immigrants of Illinois, Literacy Powerline and the Association of Latino Men For Action.